I took this trip on the 24th of September. Got busy and almost forgot to write about it! These hardy yellow asters thrive in an otherwise very dry landscape. I have taken the American River Bikeway (also known by other names) west into Sacramento many times, but never east, so that’s what I decided to do one recent Sunday. 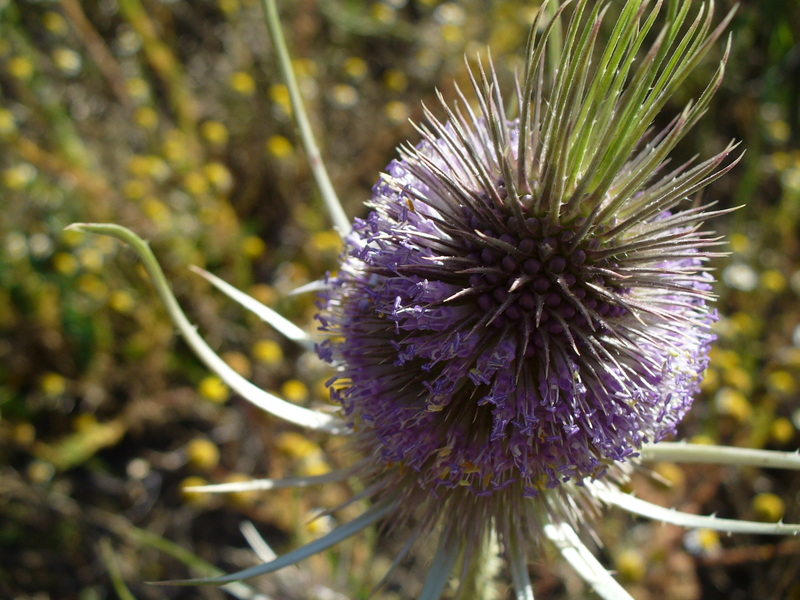 Here is another plant that grows in dry areas. But the fruit needs shade. I have already written about the plants that grow along the river, but I never tire of photographing them – always hoping for a better shot than the last one. The jimsonweed with its huge white whorled flowers is always interesting to take pictures of. 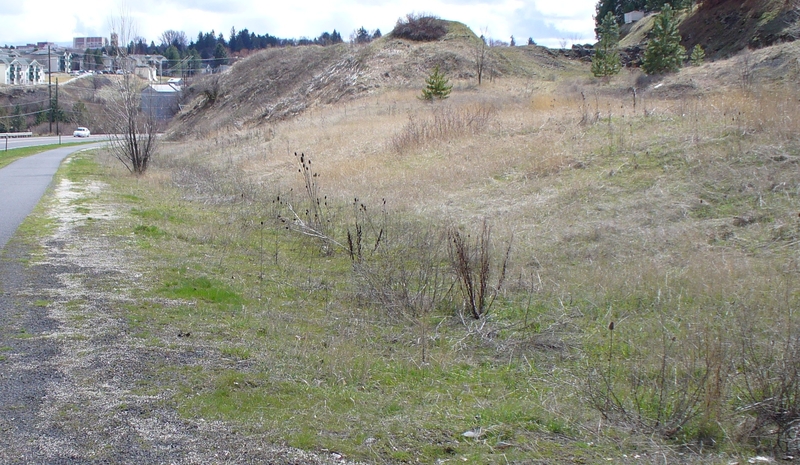 The trail east (towards Folsom) goes through drier land than that found downriver. And at one point the soil becomes almost 100 percent large gravel. This is a deposit from an ancient glacier, as far as geologists can tell. 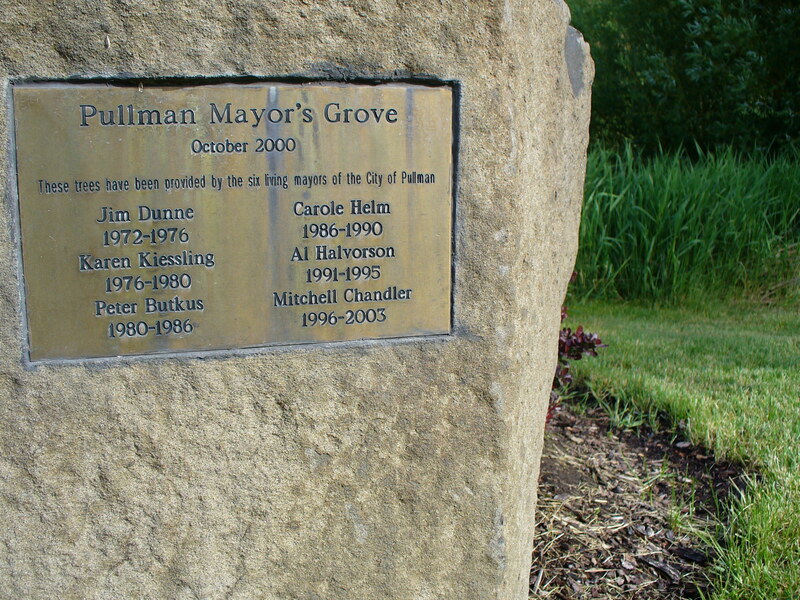 The stones are very worn and rounded. You will see these boulders in gardens; there is so much of it around here. 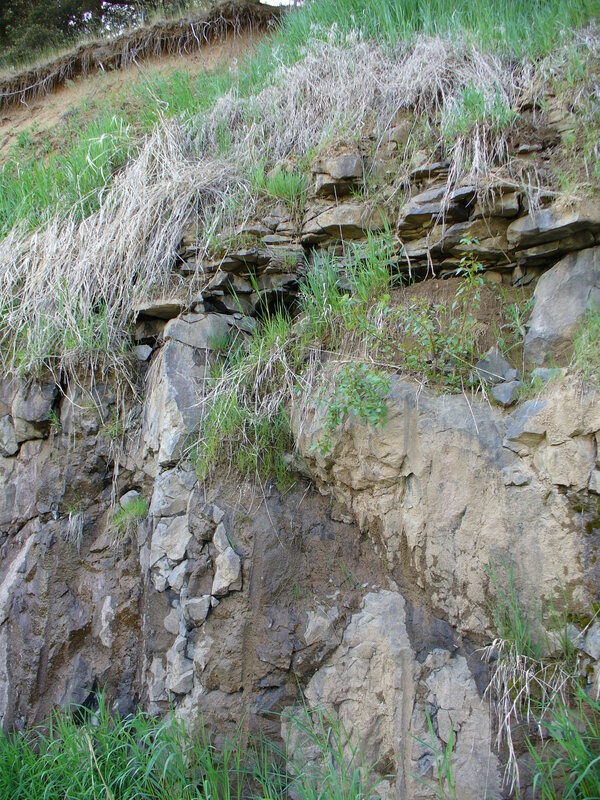 There is also an area of cliffs upriver. I took some pictures, but they didn’t seem very exciting and I didn’t really want to go on about geology, as it’s not my subject. There are also some really fancy houses up on top of those cliffs (other side of river). The views from up there must be pretty darned good. 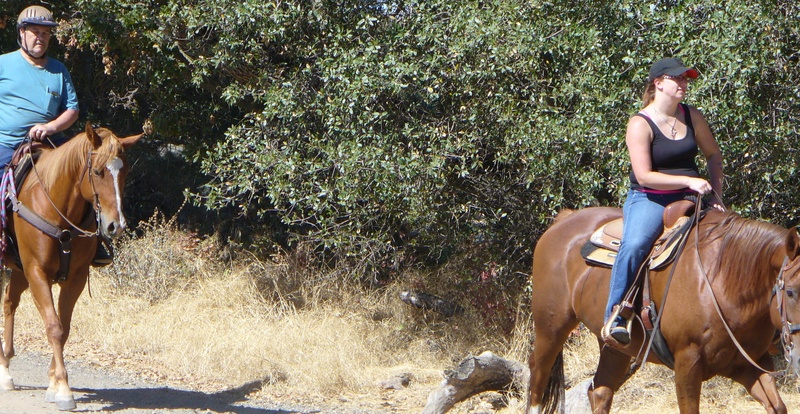 Meanwhile, down on the trail a little group riding horses pass by. Horses are allowed along most of this trail, but they have their own paths they are supposed to follow, so they won’t interfere too much with the bike riders. These paths weave in and out along the river bank, sometimes using the bike path shoulder. This time of year you can often tell if there are horses ahead because their passing stirs up dust. About a week before I made this trip, I saw a very large bird – probably a blue heron – land on the roof of a nearby house. It reminded me of seeing large birds following the creeks of Pullman down to wintering grounds closer to the big rivers, where it stays warmer and the water doesn’t freeze over. But the fish eaters in this region don’t need to migrate. It never freezes here. Yet these birds do move around, and I am sure they are joined by more birds that summer at higher elevations were it does freeze in the winter. So there was one, one day, standing on a rooftop in Sacramento. 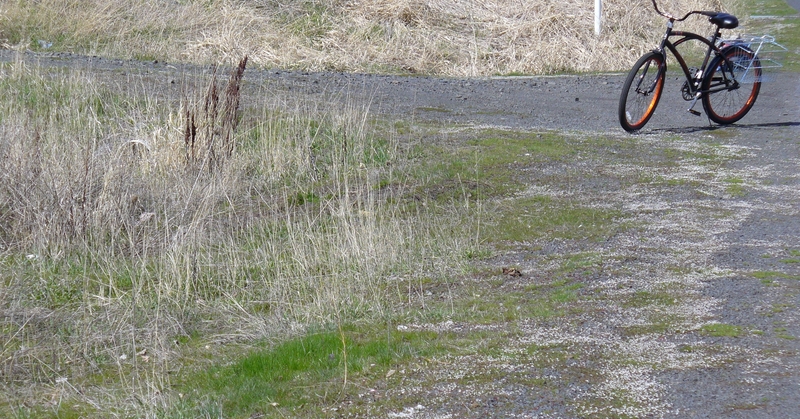 And then on this trip I saw this bird, an egret, by the trail. Myself and another photographer got pretty close to it before it took off. She had a fast camera and said she got a picture of it flying. It is really quite a large bird so seeing it in flight close to the ground is quite dramatic. My attempt to photograph it in flight captured only blue sky. An another subject, there is the question of the “California Lilac.” Someone decided to call a bushy tree that somewhat resembles the traditional Lilac of the northwest, midwest and east coast by this name. 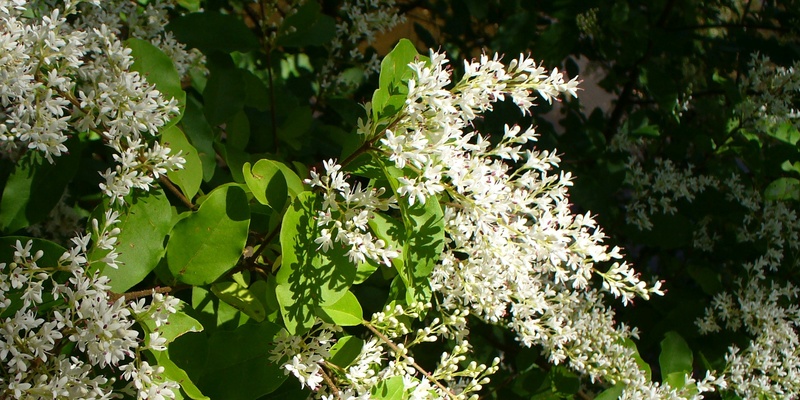 The Lilac we are used to in “temperate” areas originates in the Mediterranean region (or Asia) and is in the Olive Family and rather closely related to the Privet (which does grow in the Sacramento area). 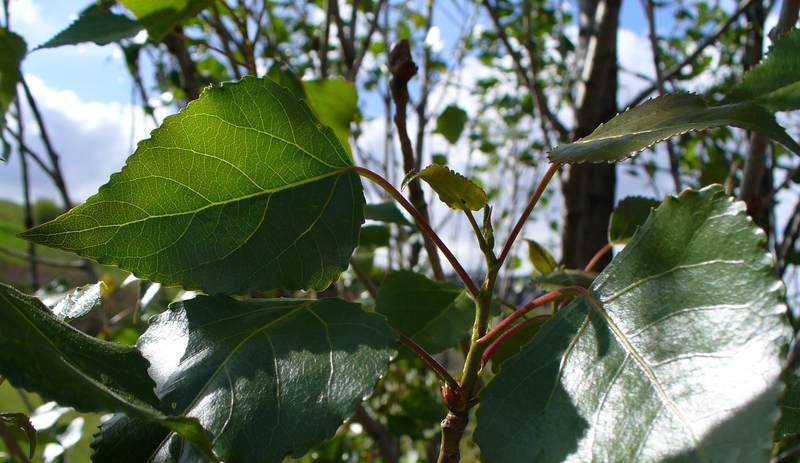 However, the plant found in drier climates named after the Lilac is in the Buckthorn Family, which has a somewhat unusual flower structure. 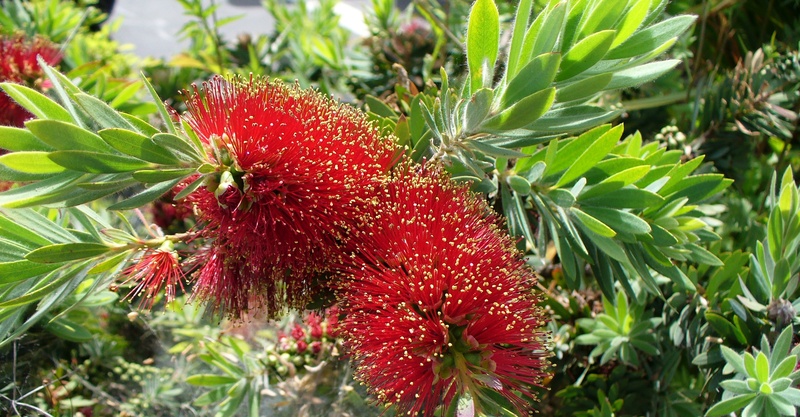 Many of these species are native to California and are seen all over the place, including in many yards and urban plantings. They can be white, pink, violet (purple). A have seen plants that seemed to have totally red flowers, but those were perhaps a different plant, as Ceanothus flower colors apparently don’t include red. 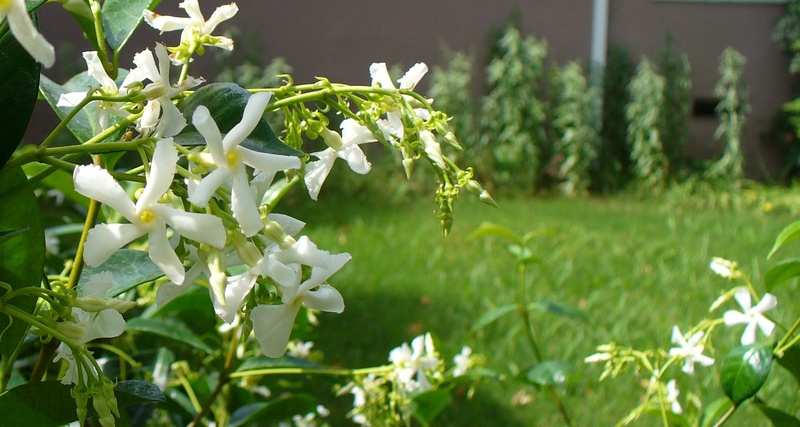 In gardens they do appear much like traditional Lilacs. 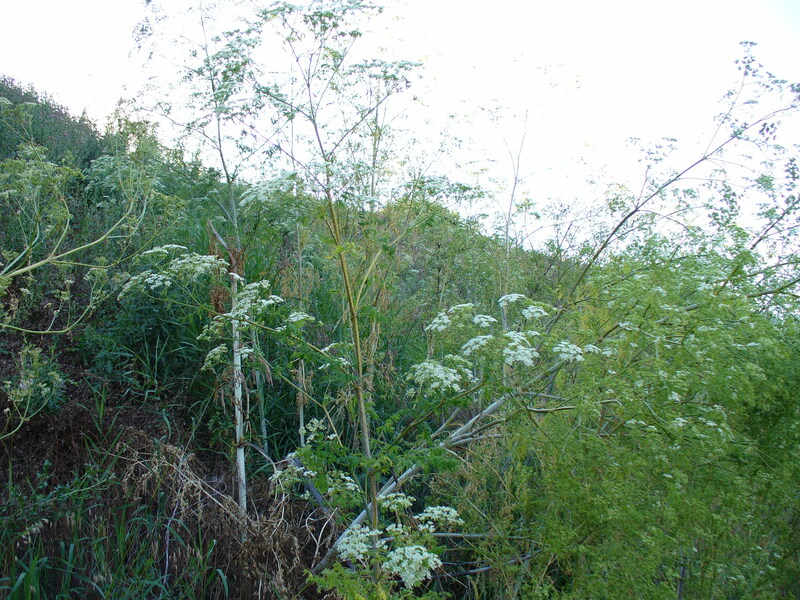 However, the larger plants remind me a lot of mountain-ash (rowan). 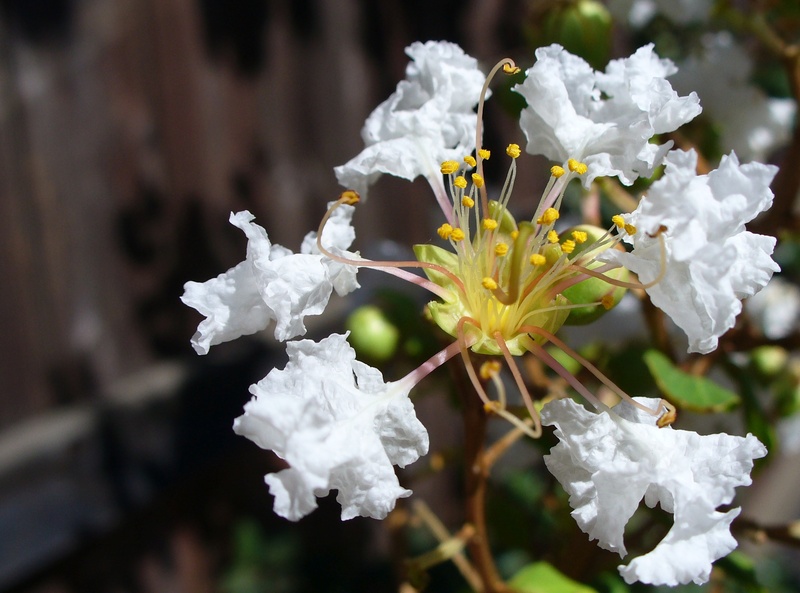 This particular specimen was hanging over a fence and getting dried out, but the shot shows its flower very well, with its showy frilled petals seated atop rather long slender stems. This plant was probably bred to have flowers this showy. California “lilac” is in genus Ceanothus. 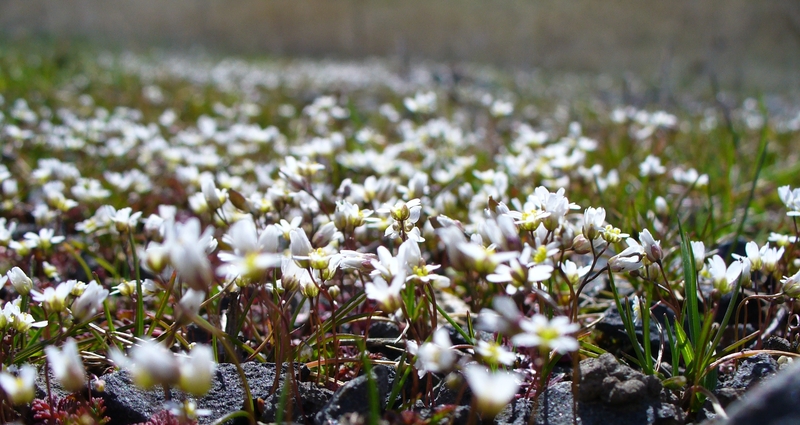 More photos of the tiny white roadside flowers! They’re back! 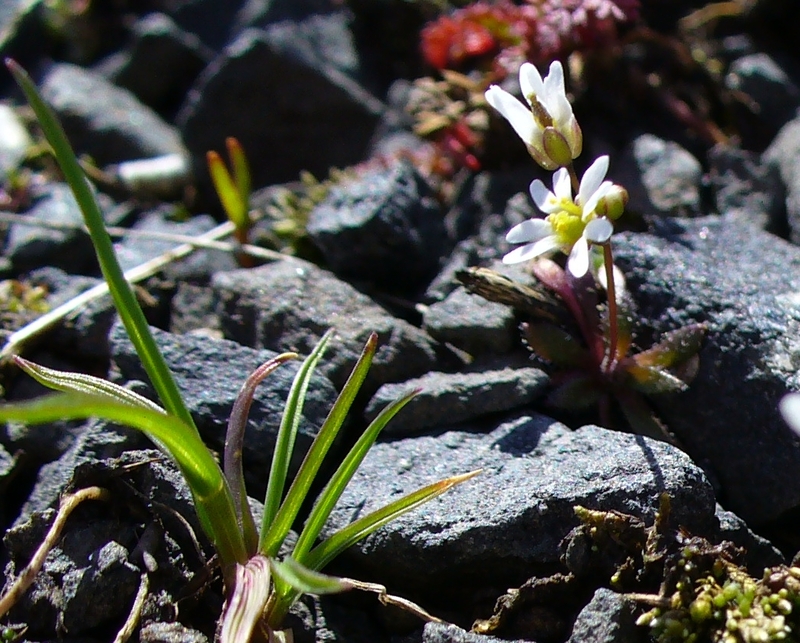 They are a crucifer, probably an alyssum that most would consider a weed. I took my camera out to “the vacant lot” on a brisk, sunny Sunday afternoon for these shots. Get closer and you still can’t really tell..
From an ant’s eye view, they look like a huge field! Basalt gravel adds a little character. They defiantly grow where no plant has grown before! One year on the Palouse as of end of January! My bicycle celebrates its first year in service. This article includes quotes from my favorite wildflower book, Michigan Wildflowers by Helen V. Smith with illustrations by Ruth Powell Brede, first published in 1961. 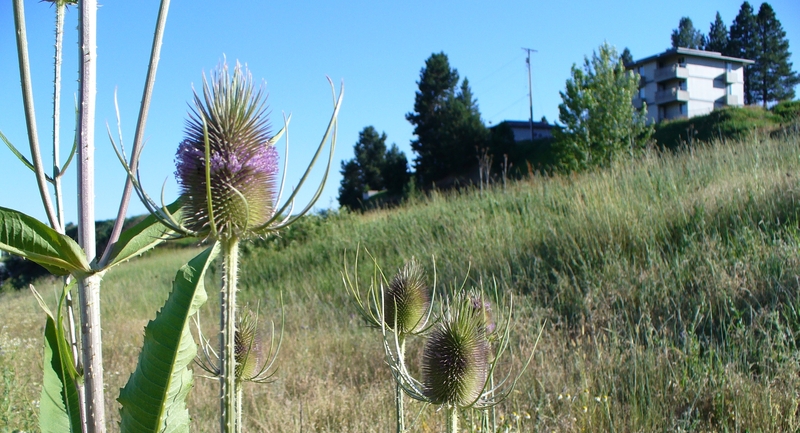 It’s “teasel time” on the Palouse; the teasels are blooming! 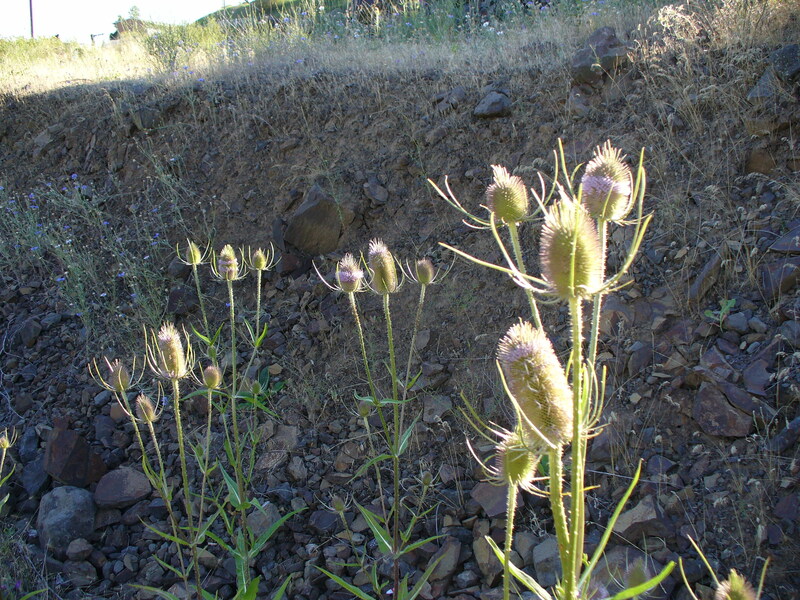 Teasels growing in a gravelly area. 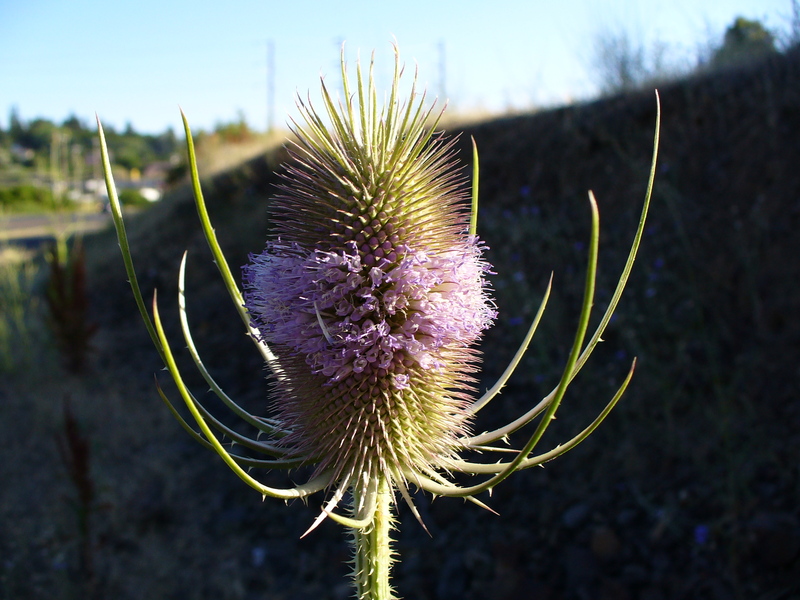 Teasel is in the Valerian Family. Valerian was a Roman emperor, notorious for being forced by others to persecute the Christians. 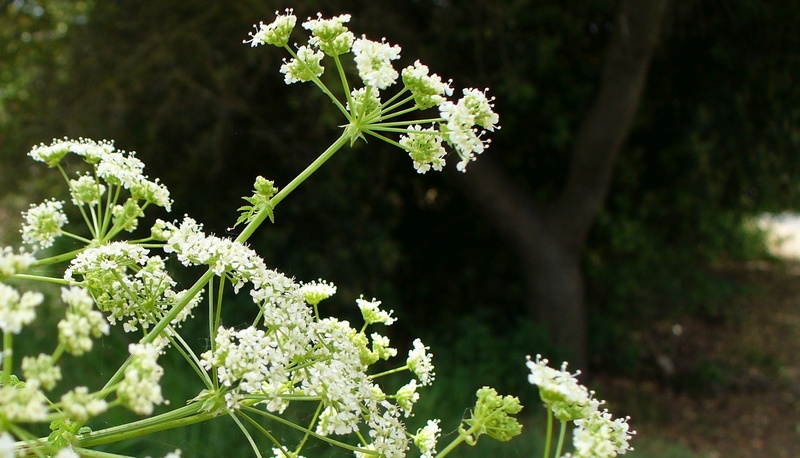 The “valerian” herb is considered a rather potent medicine. 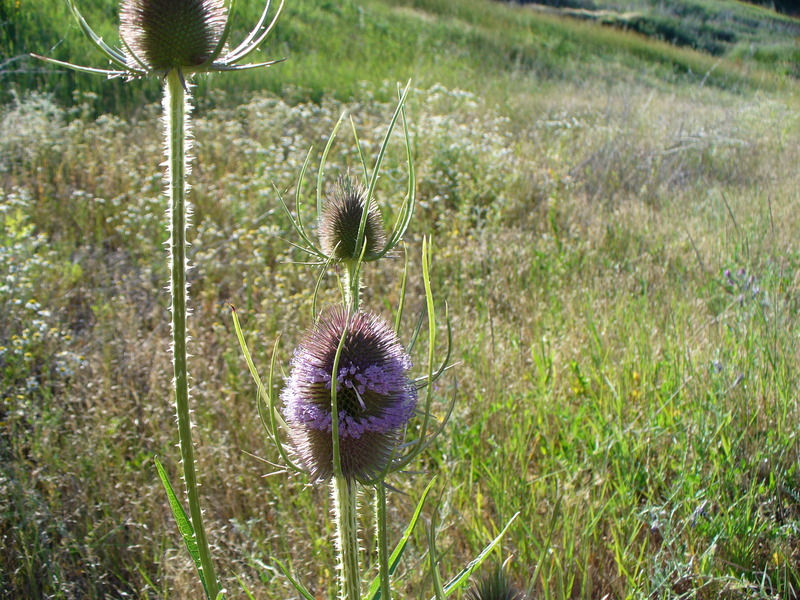 Teasels are not native to the Americas. 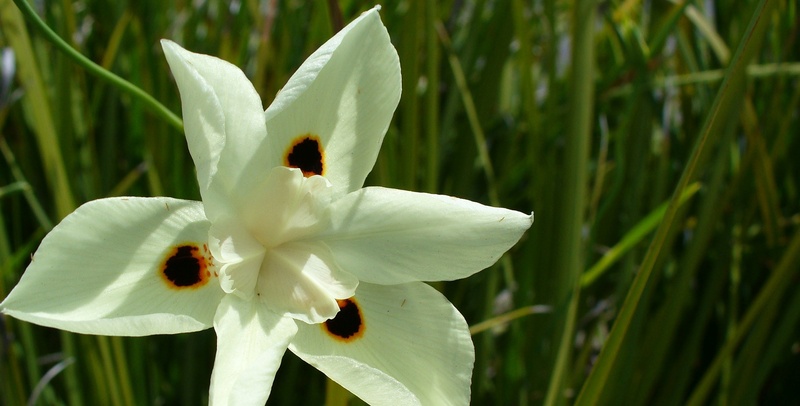 These flower heads are quite noticeable when blooming, particularly up close. 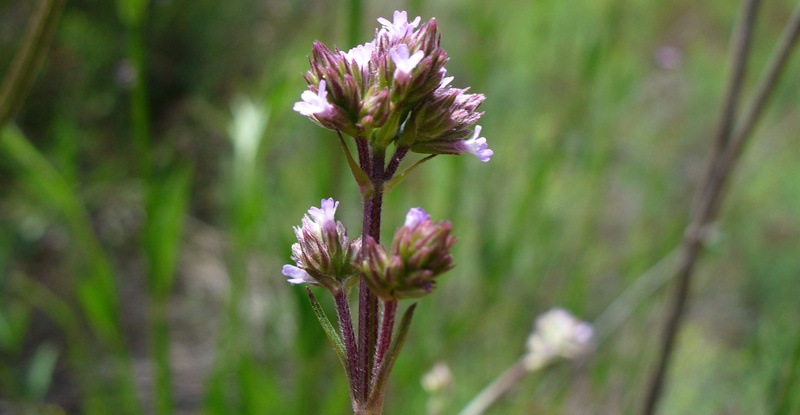 The flowers are very small, but numerous, and bloom in rings around the head, which gives an unusual and distinct appearance. This of course is also the time when many other summer flowers bloom. I photographed a few notable examples in a nearby field. 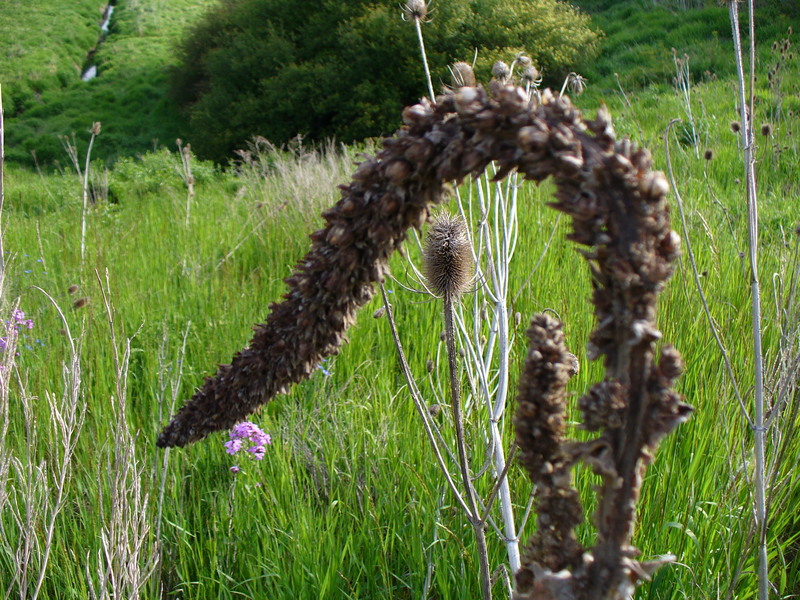 Next we see a teasel growing alongside a Mullein plant. 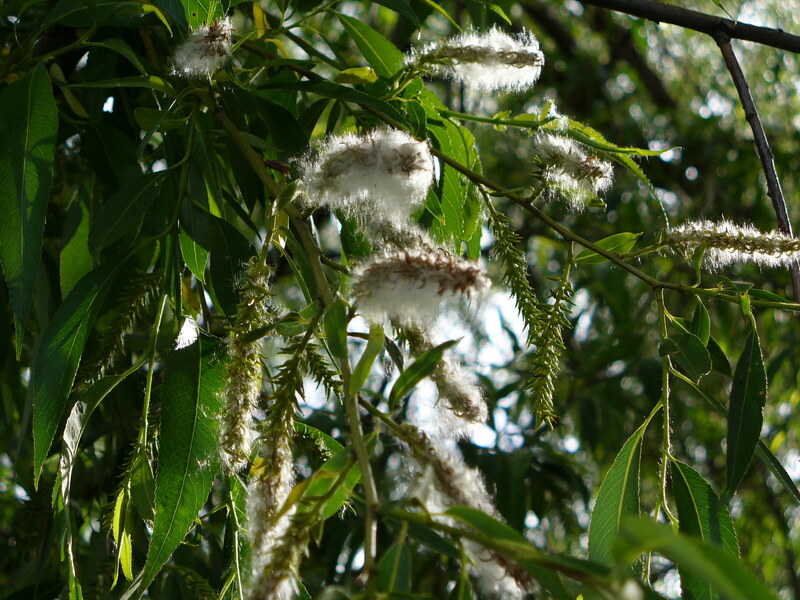 Also known as “Flannel Plant,” its leaves are unusually fuzzy. Mullein is in the Figwort family. This family also includes Foxglove. 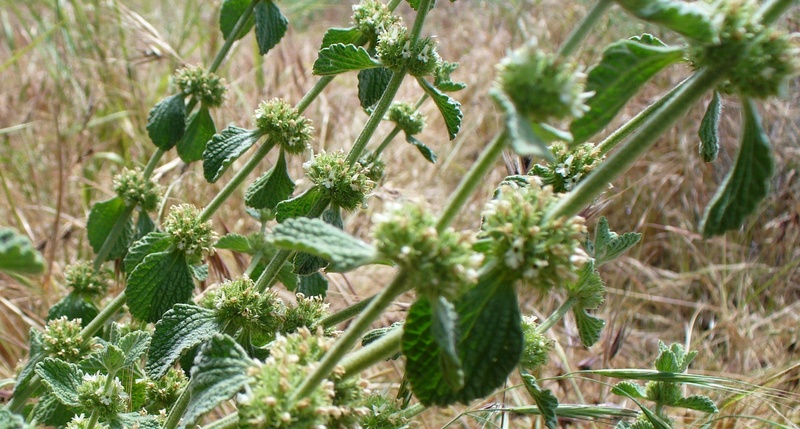 It is plentiful here, but it is one of many weeds introduced from Europe. 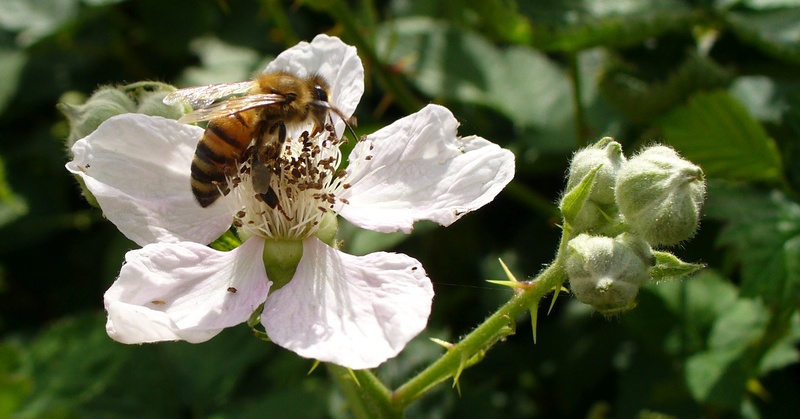 In this area its flower heads are commonly attacked by insects. 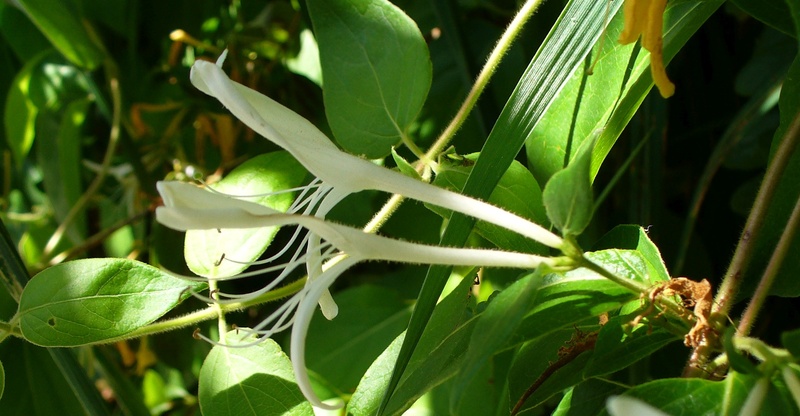 I know from other sources that its leaves and flowers have been used for centuries for their medicinal properties. 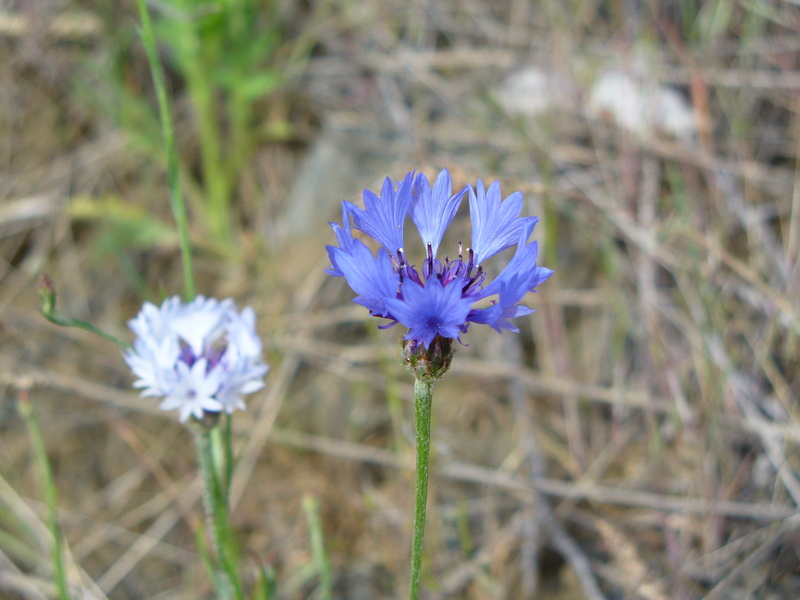 One fascinating aspect of studying wildflowers is to find out how many were used for medicine in past times. 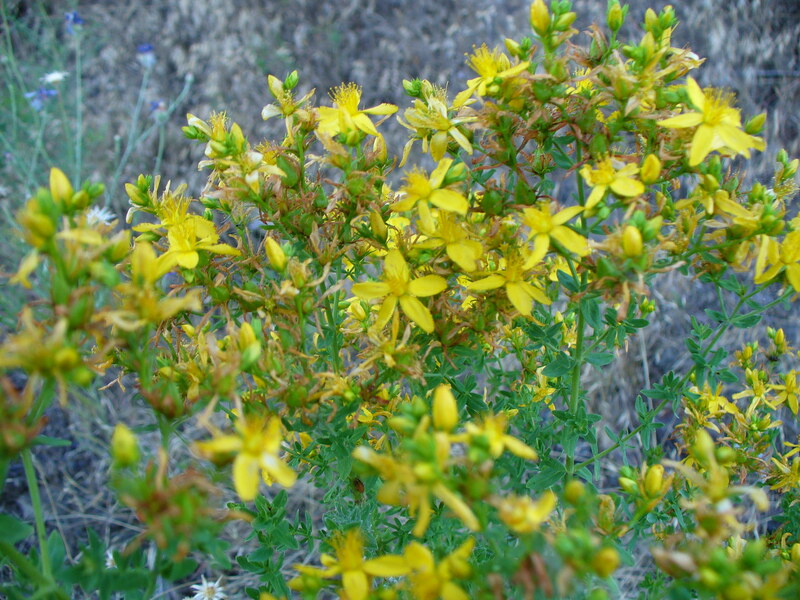 St. John’s-wort is showy when it first blooms because of all the flowers. When not blooming it is rarely noticed, but grows practically everywhere. 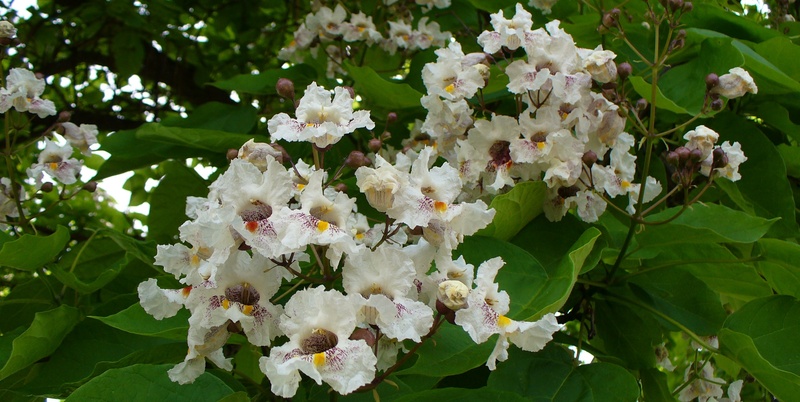 Its small leaves are peculiar in that they are speckled with numerous translucent dots. 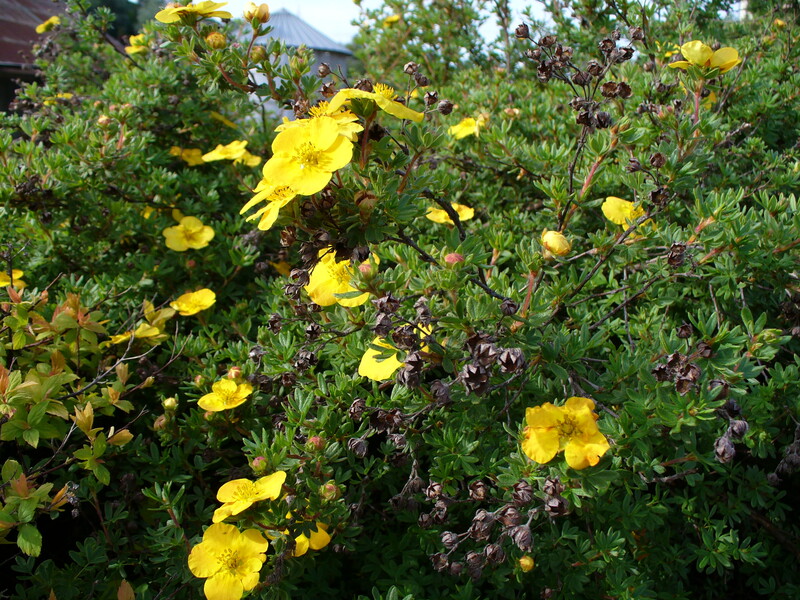 The common species (Hypericum perforatum L.) was introduced from Europe. 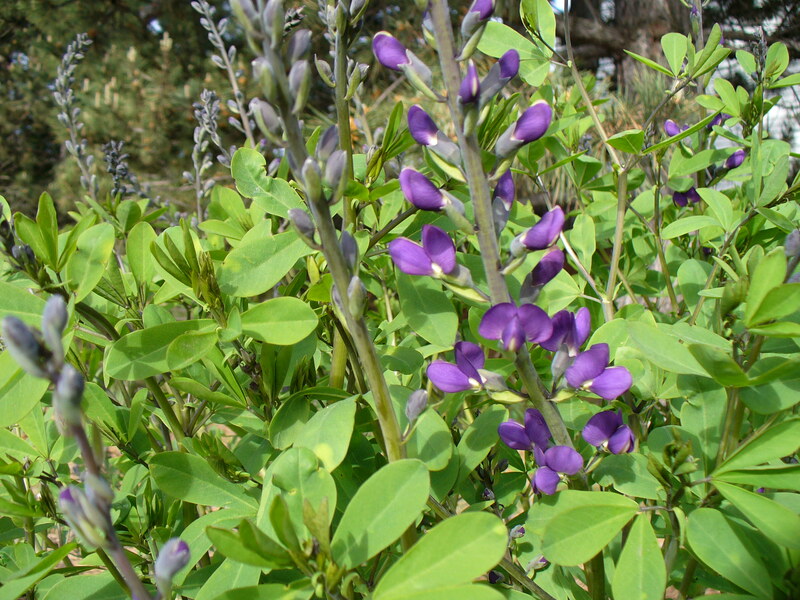 It was known there as an herbal medicine and the plant does indeed produce at least two biochemically active compounds. 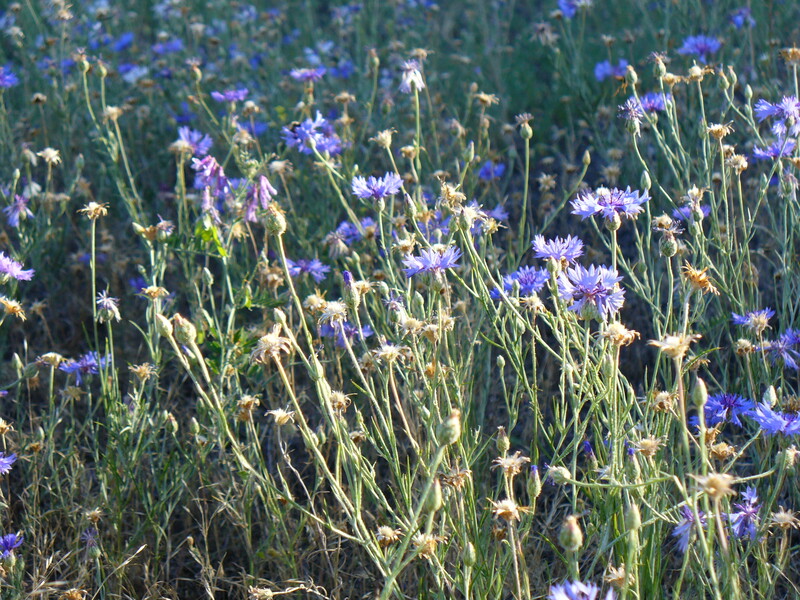 I have yet to positively identify these striking blue-flowering plants, though they seem to be very similar to the Star-thistle. 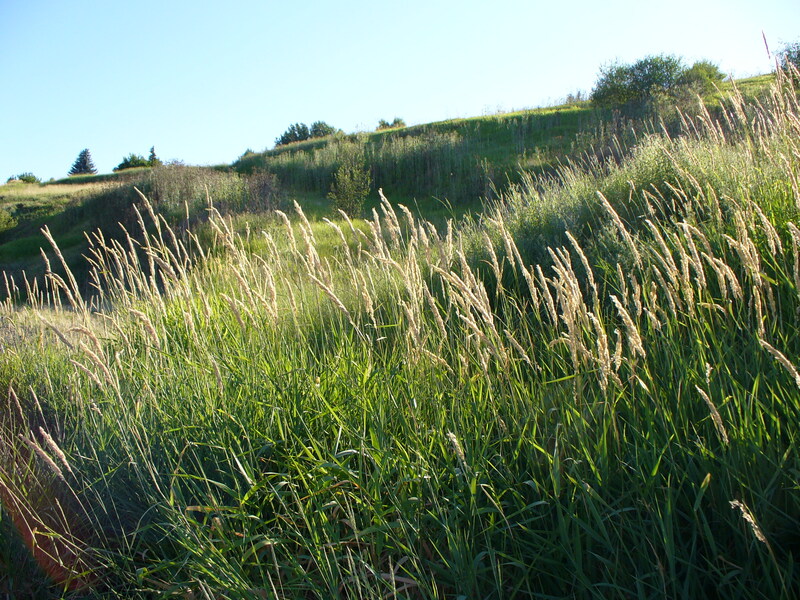 Of course the Palouse is covered with grasses. 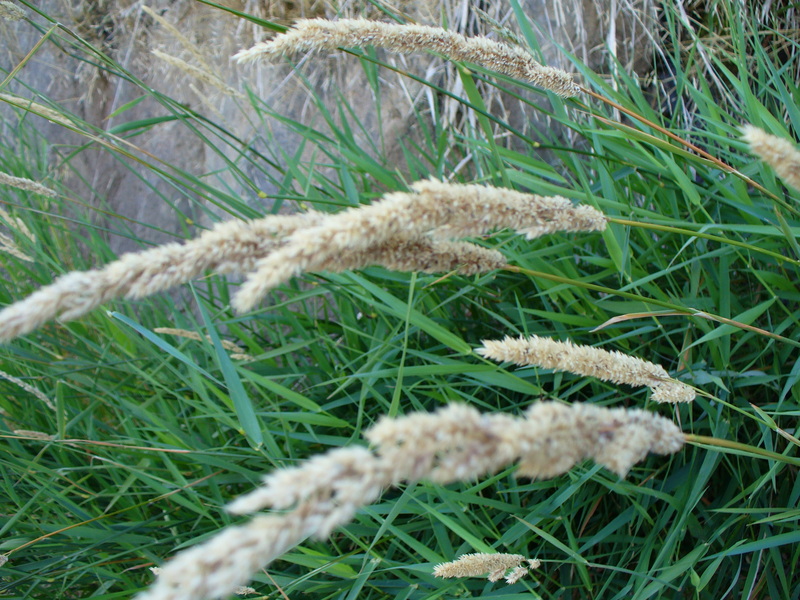 I am not a grasses expert, so can’t tell you which one these are. 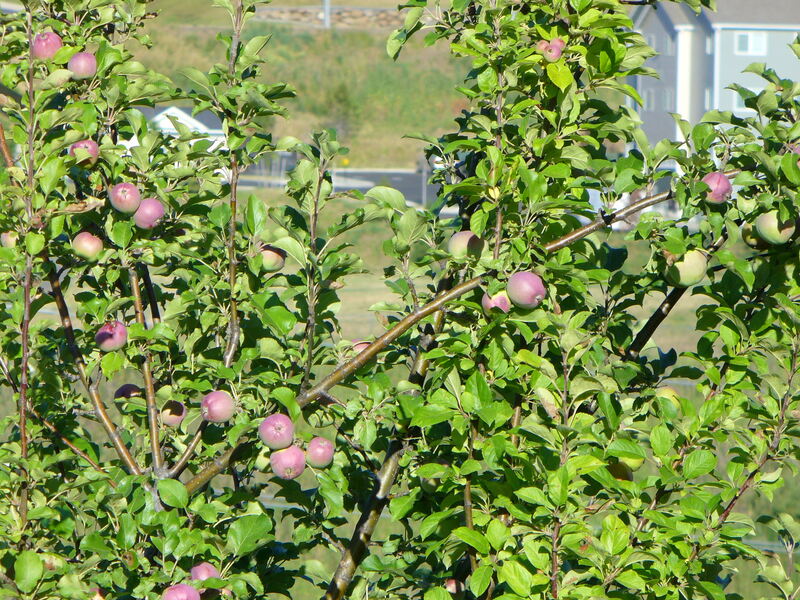 I should not ignore the fruit trees. 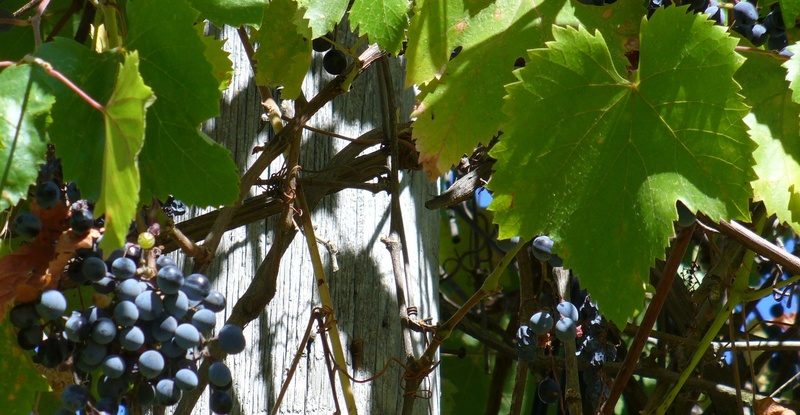 They are growing produce that will turn ripe a bit later in the season. It is calming to walk among these growing things and see them surviving, persevering, quietly and without complaint. Is it not part of our work here to look after them? 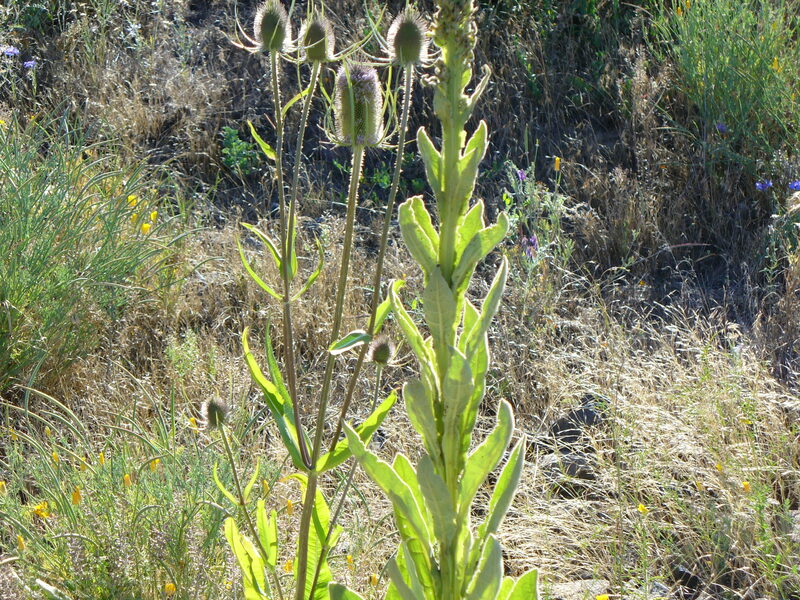 Last year’s mullein and teasel still lord over the smaller plants. 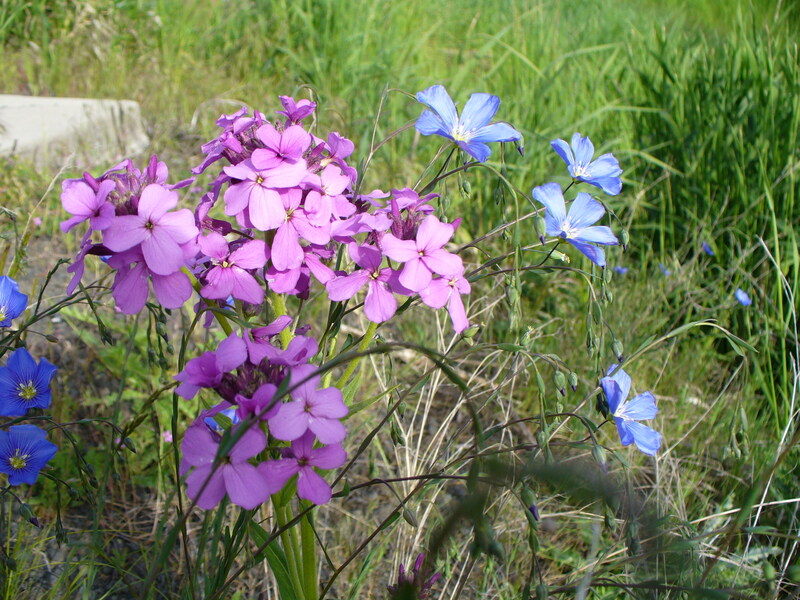 Long-time garden escapees, Dame’s Rocket is the four-petaled flower, while Flax has five petals. 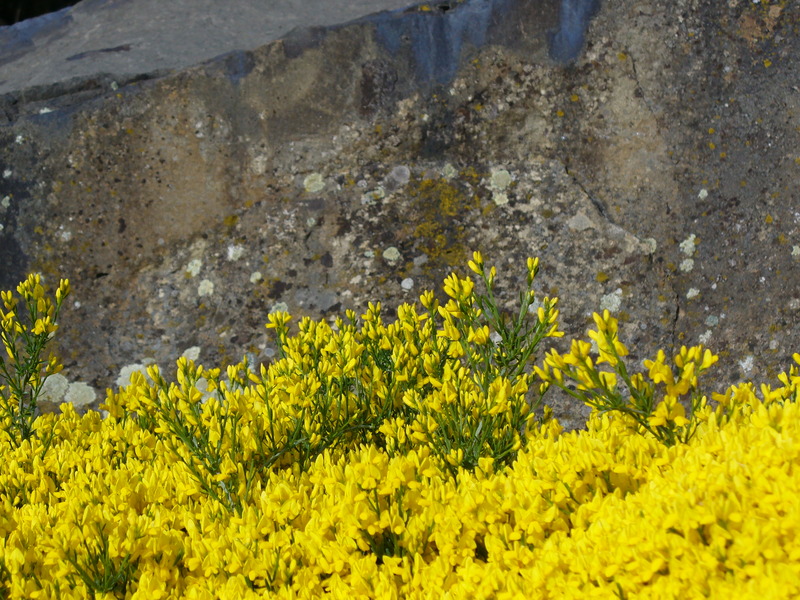 A carpet of bright broom stays close to the ground. I have not yet identified this one. 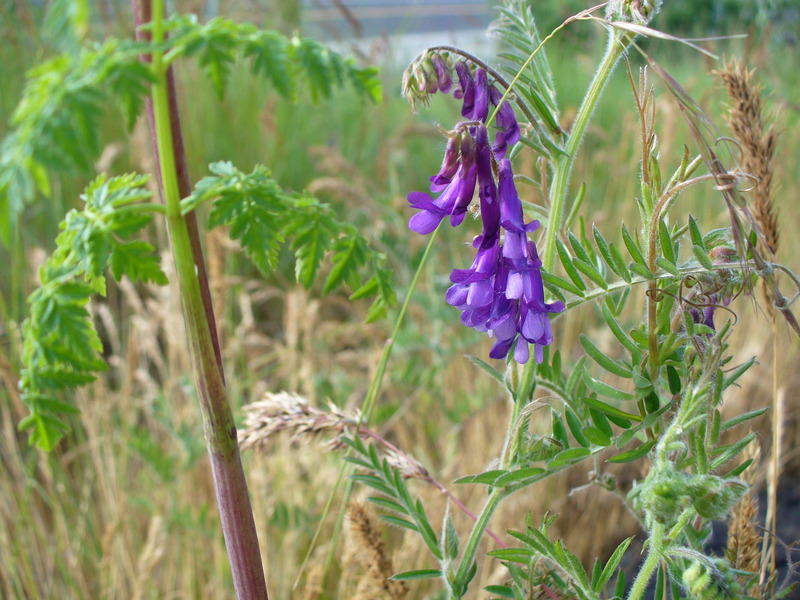 Vetch – very showy while it blooms. Another pea family plant. I believe this is a cinquefoil. 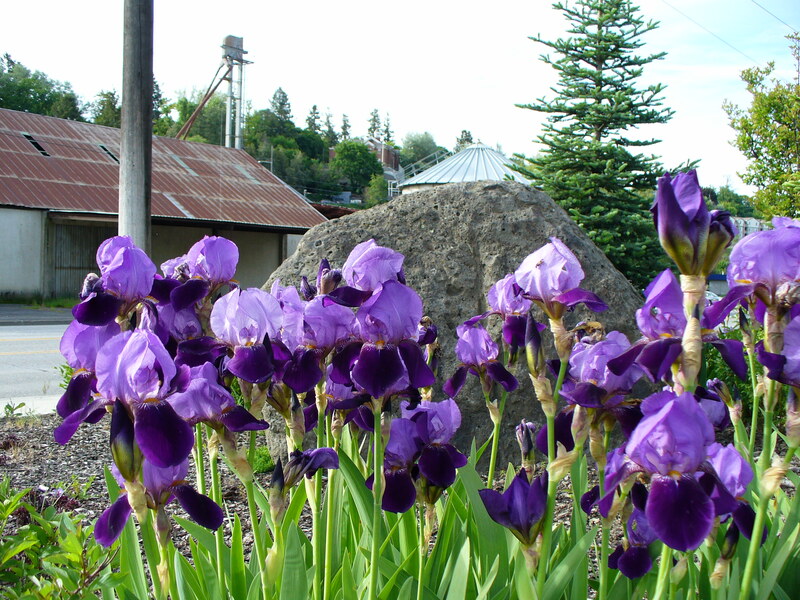 Garden iris in a city-maintained corner mini-park. 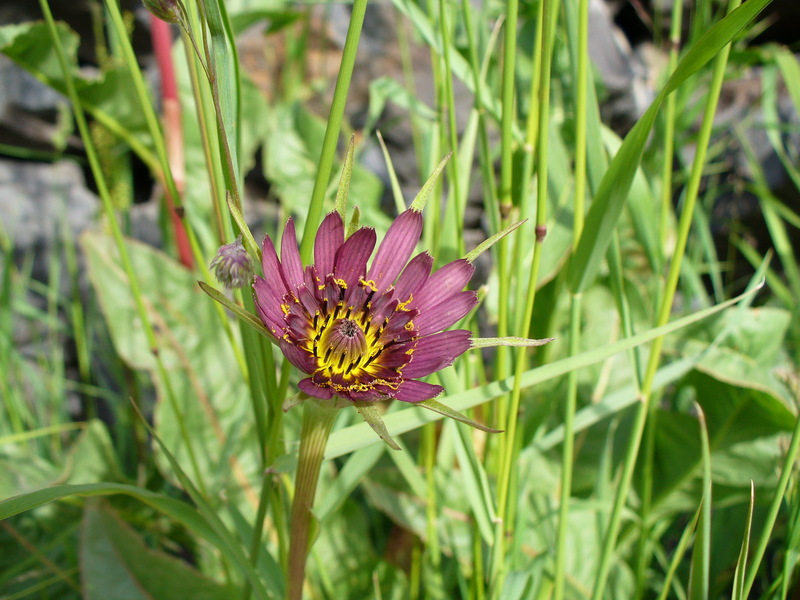 Purple goat’s beard, also called Salsify. The roots are said to be edible. 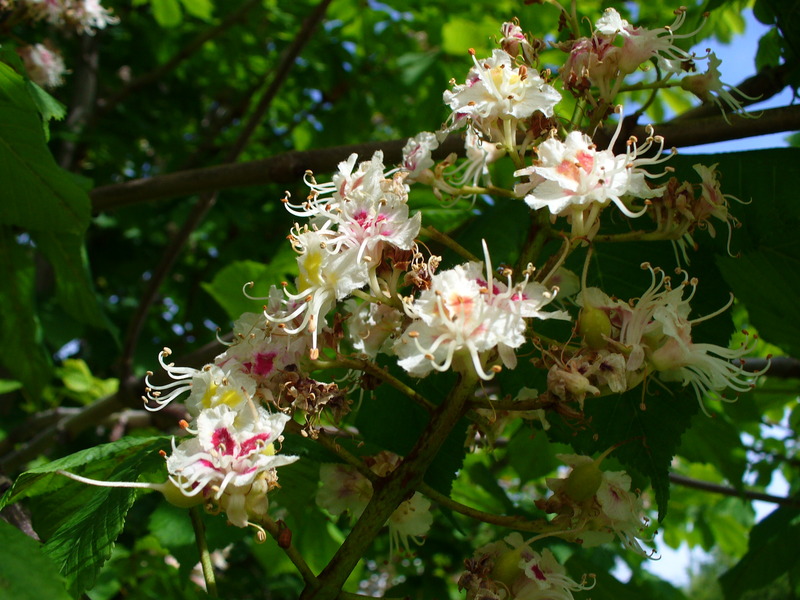 Horse Chestnut. A very showy tree while blooming. 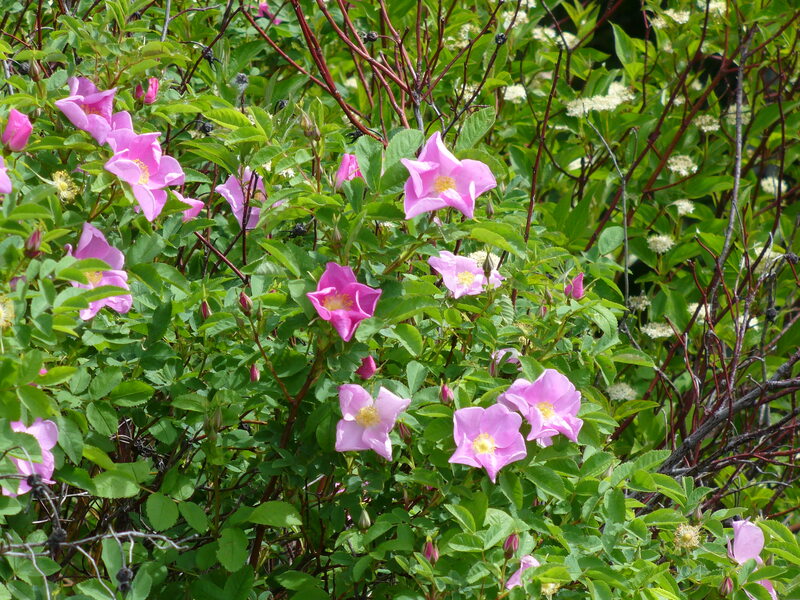 Wild rose bush, with dogwood in the background. Storksbill going to seed. 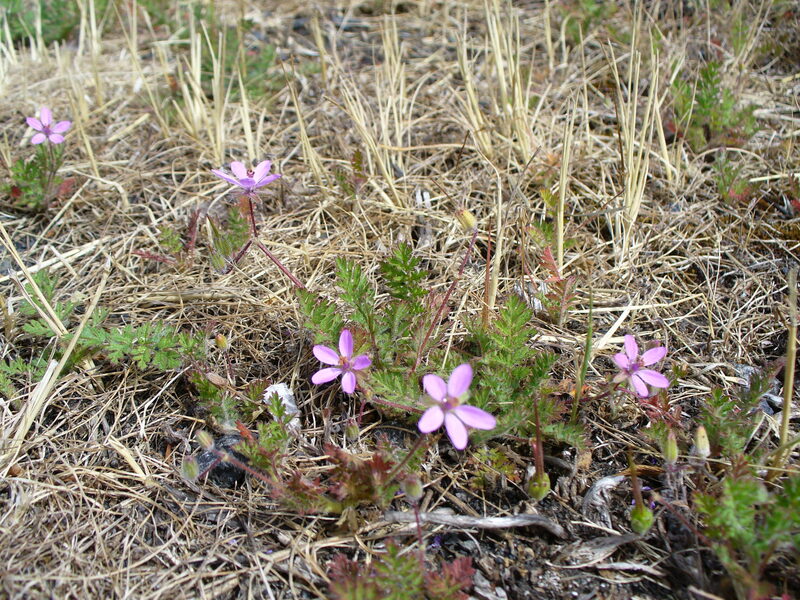 A tiny spring flower related to the geranium. 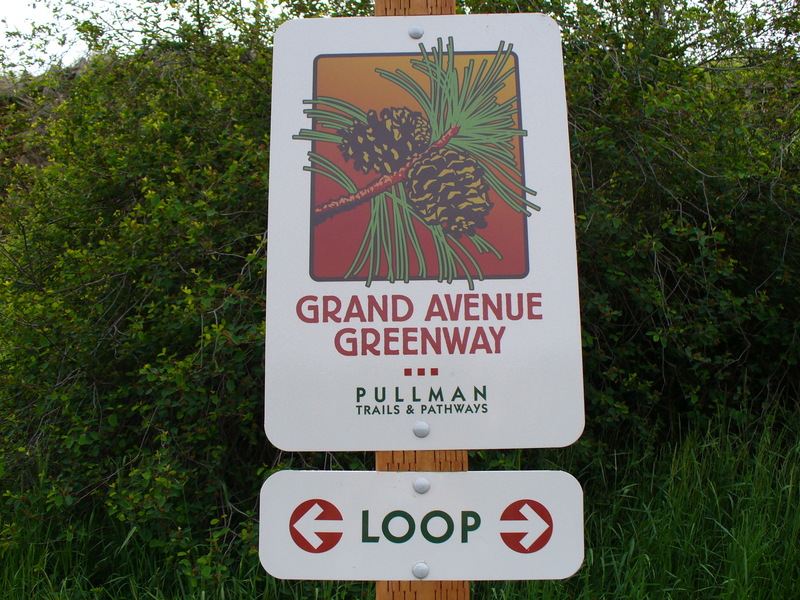 Grand Avenue Greenway trail sign. 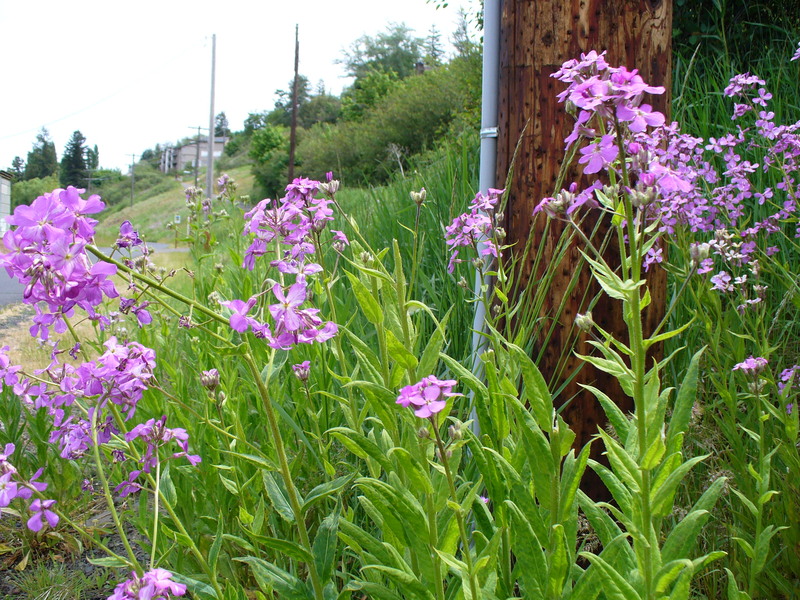 Dame’s Rocket abounds in this area. It is a crucifer – mustard family. The day was beautiful so I took some time to walk around the corner to the vacant lot, with my camera. The lot, showing bluff, apartment buildings, grass, trees and flowers. 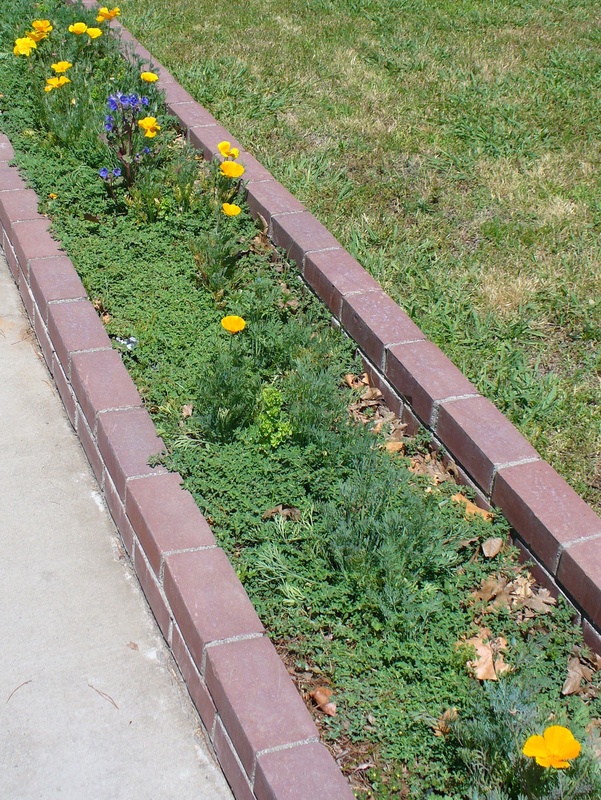 …shown sharing the field with alyssum. Their orange flowers are unmistakeable. The small trees are cottonwoods. 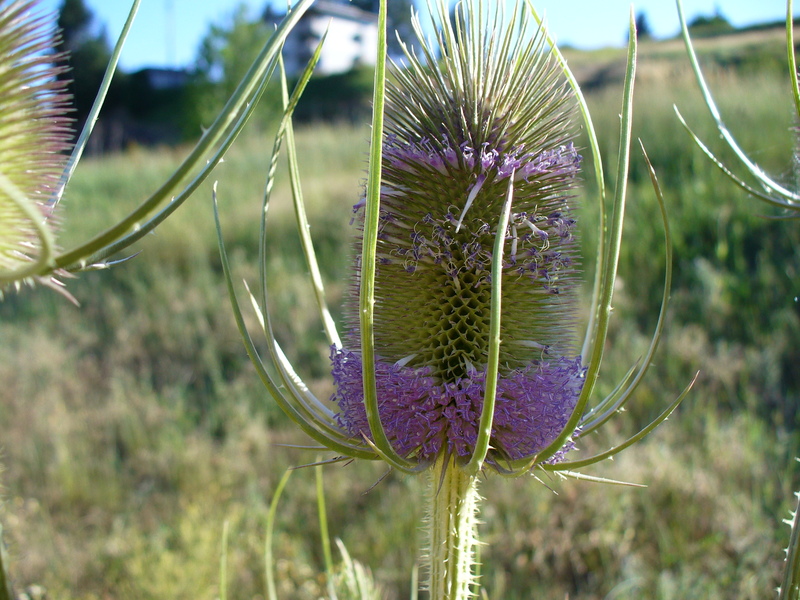 Last year’s teasel stands tall. 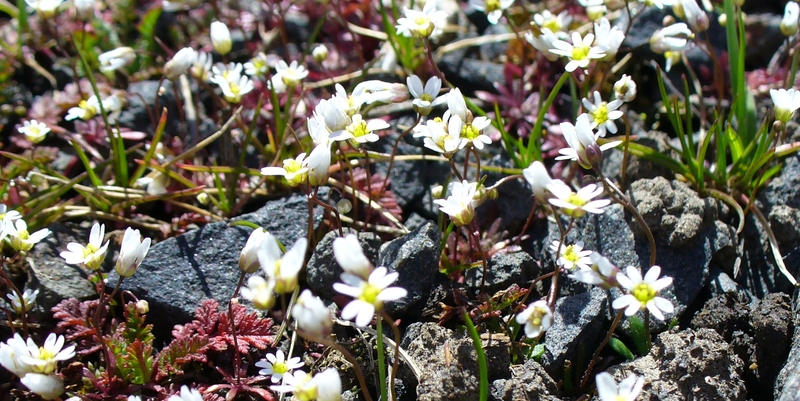 They thrive in disturbed soil. The cliff beneath the bluff is man-made. A dandelion flower survives in the cliff’s shade.